Avant-garde fashion darlings Viktor Horsing and Rolf Snoeren of the celebrated Dutch design duo Viktor & Rolf announced Tuesday that they will be leaving ready-to-wear to focus exclusively on their couture and perfume lines. The design duo’s decision comes after Jean Paul Gaultier announced similar plans in September of last year. Could this become a trend? As hard as it is to imagine a world when high fashion ready-to-wear was not the pinnacle of the fashion hierarchy (fast fashion being at the absolute bottom), the decision to focus solely on haute couture, made-to-order clothing, actually reflects a return to the pre 1960s fashion world where couture reigned supreme. A time when the namesakes of today’s leading luxury brands, such as Cristobal Balenciaga, Coco Chanel and Christian Dior, were still alive and would never dream of exclusively designing ready-to-wear clothing, just as the majority of designers today could not imagine just designing couture. It was only with the 1960s Youthquake Revolution that a new generation of young, exciting RTW designers emerged to challenge the dominance long-held by couturiers who had been the leading tastemakers in fashion since the mid-19th century. Visionary couturiers such as Yves Saint Laurent adapted to the times with their own ready-to-wear lines, but other once-influential houses, notably Worth, closed. Couture has since largely become a realm reserved for more avant-garde experimentations, à la Viktor & Rolf and Gaultier, an assertion of a brand’s prestige and luxury rather than a viable moneymaking venture (although it is purchased by a few wealthy elite). Couture is the arena in which Viktor & Rolf have stood out over the years and they are looking forward to the move: “We feel a strong need to refocus on our artistic roots. 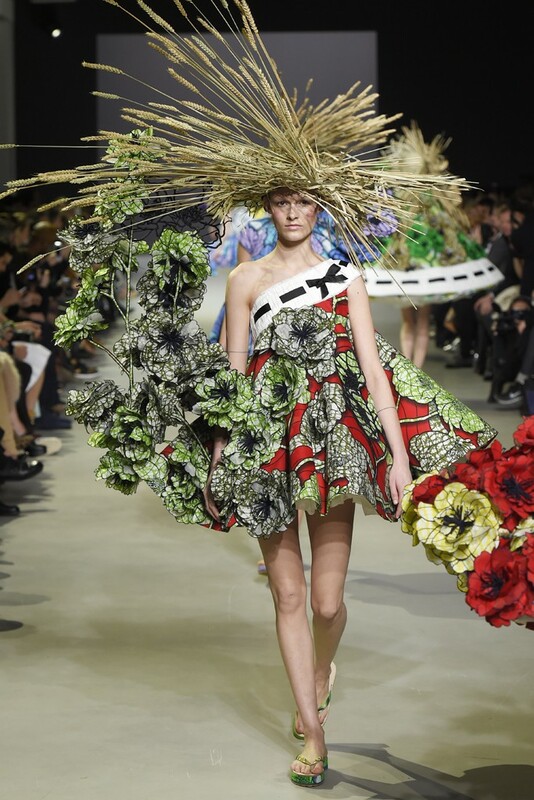 We have always used fashion to communicate, it is our primary means of artistic expression,” said Viktor and Rolf in a joint statement, “Ready-to-wear (with its fast pace, many deadlines and fierce competition) started to feel creatively restricting. By letting go of it, we gain more time and freedom.”[i] I, for one, welcome their exclusive focus on couture because it places an emphasis on and brings attention to hand-craftsmanship–skills largely lost in today’s world of cheap, mass-produced clothing. While prohibitively exclusive to all but a select few, we can all enjoy these beautiful designs–if only as avid admirers of the art of dress. 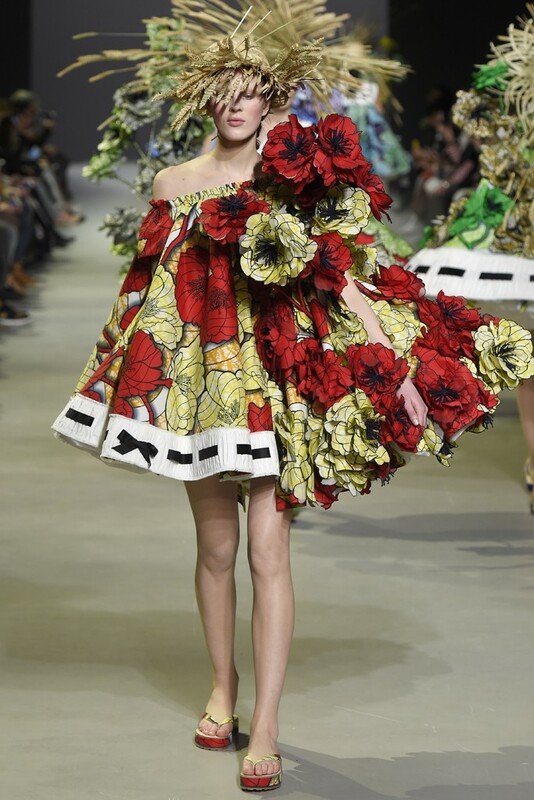 For Viktor & Rolf’s Spring 2015 Couture show, the design duo wanted to have a collection “where prints come alive,” said Snoeren, and to see “how far we could take it in terms of volume.”[ii] This experiment translated into over-sized floral patterns that literally came off of the fabric to create three-dimensional creations more akin to sculpture than clothing. 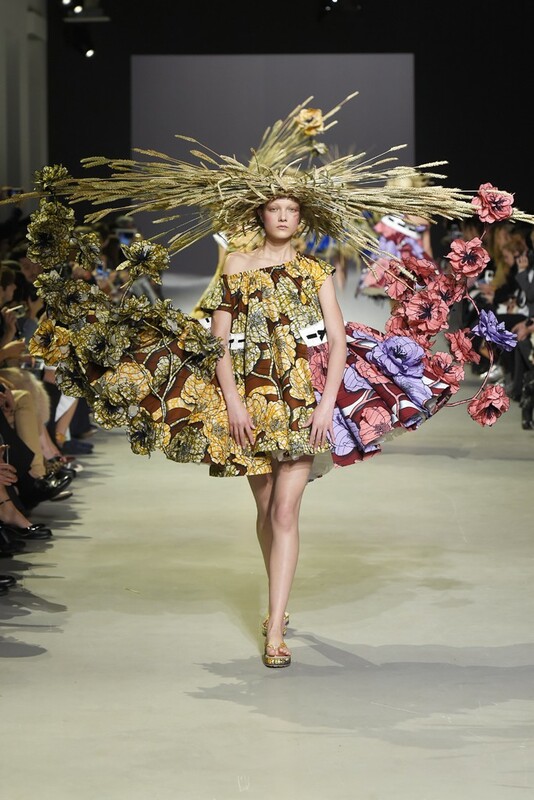 But the genius of Viktor & Rolf is their ability to prove that fashion can be both. While the duo’s most recent collection is perhaps not the most functional or practical, it is certainly the most-inspired of the season and can be, and will be, worn by a clientele with a keen eye for artistic flair—and history. In the case of this collection, Viktor and Rolf embraced two aspects of their cultural heritage: the influence of Dutch wax cotton in Western and Central Africa and one of their country’s most famous artists, Vincent Van Gogh. On the Viktor & Rolf runway, these two seemingly disparate subjects merged to create a summertime reverie. 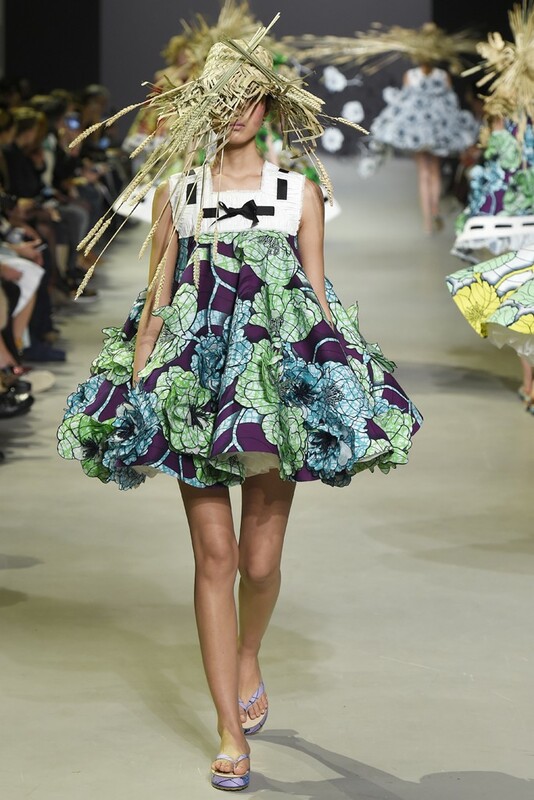 “The quintessential summer look: a floral dress, a straw hat and flip-flops,”[iii] said Snoeren–with the unmistakable Viktor & Rolf twist, of course. The Dutch wax cotton company Vlisco, who provided all of the fabric for the V&R collection, have been making and selling their version of wax resist-dyed fabrics to West Africa since 1846. Eager to cash in on local demand for colorful Indonesian batiks, Vlisco began to manufacture the fabrics en masse in the 19th century, cornering the market and solidifying a relationship that survives to this day. Instead of masking the fabric as just another ingredient in a garment’s construction, Viktor and Rolf made it the main focus of this collection. The first patterned dress of the show appeared colorless, a black-and-white coloring book waiting to be filled in. Color was added in each ascending look before it broke free in sunbursts of color with rich, beautiful combinations that are synonymous with the Vlisco aesthetic. Over-sized selvedges, normally hidden, edge some of the garments while large floral patterns descend from the fabric to form intricate three dimensional structures. Van Gogh is also present in the colorful ensembles, equally reminiscent of his celebrated landscape paintings, as are the over-sized straw confections that accompany each outfit. 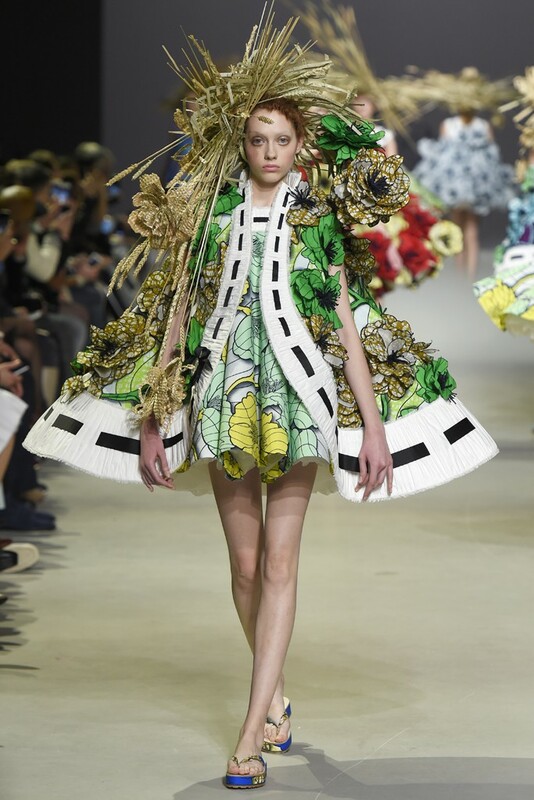 Viktor and Rolf evoked Van Gogh’s “raw energy” and even his madness in their unbridled floral structures, a point underscored by the collection’s accompanying soundtrack from the psychological thriller Rosemary’s Baby.